Unfortunately, Michigan is known for being a state with constant problems in regards to nursing home neglect and abuse. Every year, it seems that professional standards and the quality of care in Michigan nursing homes continue to worsen. From the development of bed sores on patients to instances where the personal belongings of patients are stolen, there are clear cases in which the legal rights of residents are violated in Michigan every day. 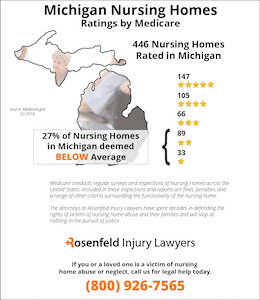 According to data gathered by Medicare, 122 (27%) of the 446 nursing homes rated in Michigan have been found to be below average compared to national statistics because of violations and deficiencies that led to substandard care. Did your loved one died prematurely from neglect or were they abused, neglected or mistreated while residing in a Michigan nursing facility? If so, contact the Michigan nursing home abuse & neglect attorneys at Nursing Home Law Center today to discuss filing a claim for compensation. We offer every potential client a free case evaluation to determine the merit of their claim. If family members suspect that these types of events are happening in a loved one’s nursing home, then now is the time to act. Now is the time to get in touch with a Michigan nursing home abuse lawyer to receive additional help in pursuing a claim against a nursing home. A nursing home lawyer can document any evidence of abuse or neglect, interview key witnesses in a nursing home and file the legal documents necessary to get your case started. Even though nursing home abuse is a widespread problem in Michigan, there are several statutes in place to help control this problem. 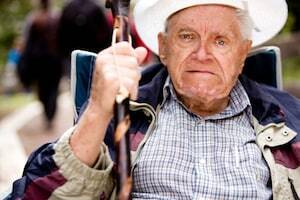 The Michigan laws that set forth sanctions for nursing home abuse are the Adult Protective Services Act, the Abusing, Mistreating or Neglecting Patient Act and the Task Force on Elder Abuse. Under these acts, any medical worker with a reasonable suspicion that an elderly person is being abused must report the abuse to law enforcement. A person is required to report the abuse within 2 hours of first noticing the abuse. He or she must not wait any longer than 24 hours to report any suspicions of abuse. It is clear that the law imposes an obligation on individuals to immediately report abuse when they suspect that it exists. In nursing homes, workers and other individuals may try to avoid fulfilling this legal obligation out of a fear of being fired, seeing a reduction in their paychecks or suffering from some other retaliation. This is why it is so important for family members to step up and get in touch with a Michigan nursing home abuse lawyer as soon as possible. Abuse may go unreported for months at a time. If a lawyer is working on your case, then it is likely that abuse will be ended and the appropriate parties will be held accountable. A lawyer will also know how to proceed in dealing with individuals who failed to report any instances of abuse. It is crucial that family members file a report even if they only suspect that abuse is impacting a loved one. Family members do not need to have any actual proof that abuse is occurring. 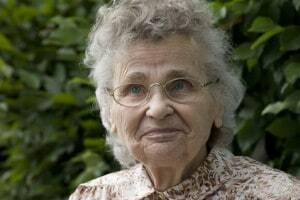 The law was designed in a manner to provide broad protection to nursing home residents. A person who has an honest belief that abuse is occurring will not be penalized for filing a report with law enforcement agencies. The management in a nursing home also has an obligation to respond to any concerns that you have about abuse or neglect. You should take careful notes of the actions taken by management to deal with your report. If no actions are taken, then this may be additional evidence that you can use in filing a lawsuit against the administrator of a nursing home. It is also important to speak with a loved one about your suspicions of abuse. A loved one is likely in a vulnerable state of mind, so he or she may not respond, may become emotional or may be offended and embarrassed at your questions. Just know that this is normal behavior for someone who has been victimized in an abusive situation. One may also resort to denying that abuse has occurred as a means of blocking traumatic events from the memory. 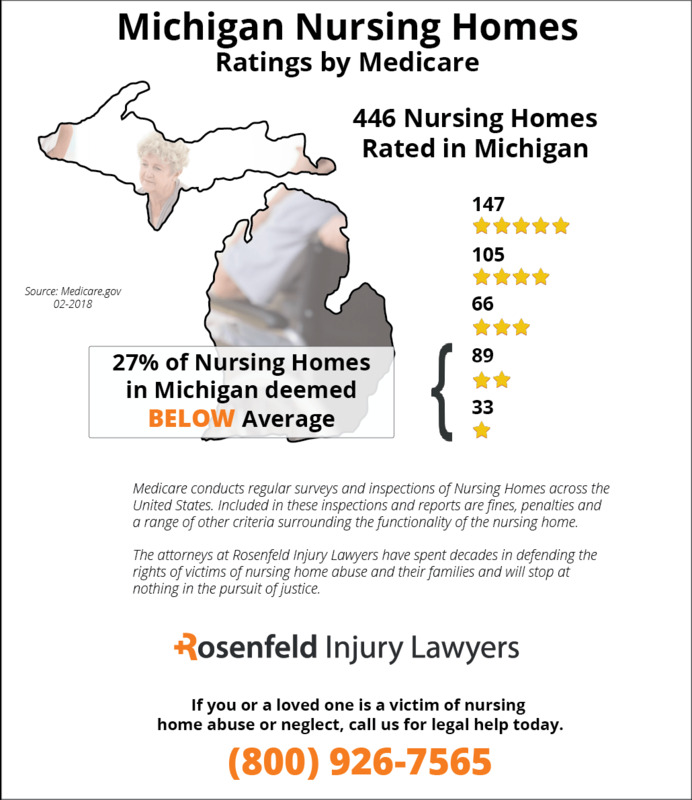 Your concerns will be appreciated and respected by lawyers in Michigan who specialize in handling nursing home abuse cases. A bedsore can easily develop when the position of a wheelchair-bound or bedridden patient is not readjusted at least once every two hours, especially if their skin is not kept dry and clean. This is because prolonged pressure to the body can quickly develop an early stage pressure sore where red spots and blisters become visible on the skin’s surface. In fact, the pressure of the patient’s weight on the mattress or padding is enough to cause the condition. If the bedsore is left untreated, the wound can easily become infected and cause serious medical consequences including death. While under the care of a medical facility, no patient should develop a pressure ulcer. Unfortunately, negligent care is pervasive in many Michigan facilities. The Michigan pressure sore attorneys at Nursing Home Law Center LLC are committed to holding nursing homes and hospitals accountable for their negligence. We invite you to contact our office for a free review of your case and discussion of your options under Michigan law. A bedsore is often called a pressure ulcer, decubitus ulcer or pressure sore. These wounds tend to develop quickly on individuals who remain in the same position for two hours or more. Common areas for a developing bedsore tend to be bony prominences on the body like the back of the head, hipbones, ankles, buttocks, shoulder blades, shoulders, heels and toes. As the bedsore progresses, the area becomes inflamed, reddened and tender to touch. All nurses, nursing aides and caregivers at the facility are required to treat every resident with dignity and respect, and ensure immobile patients do not remain seated or bedridden in the same position for too long. By repeated turning or repositioning, the pressure on the skin can be alleviated, diminishing the potential of developing a sore. Bedsores will start to develop when blood flow is restricted to the area, reducing the amount of oxygen necessary to keep the tissue alive. In its early stage, the bedsore can be healed within days or weeks through proper treatment protocols and continuous monitoring and turning of the patient to keep pressure off the area. Alternatively, serious pressure ulcers can become a deep crater open wound, exposing muscle and bone. In advanced stages, serious infection can set in, causing a life-threatening condition. Many patients in nursing facilities die from bedsores as an underlying cause to another problem. While the aging population is at risk of acquiring a bedsore, nursing home patients have the greatest potential of developing serious pressure ulcers. They often occur through negligence of the medical staff at the facility providing substandard care to the patient. Many families make the decision to place a parent or grandparent in a nursing home to ensure they receive quality care to improve or maintain their health. The families are often assured that the facility’s caregivers will provide every necessity and dedicated care to their loved one. So, it is no wonder when family members are disturbed when they suspect that neglect or mistreatment has caused their loved one to develop a serious pressure sore. Likely, the family was never informed that most nursing homes are profit-making businesses and often save money by understaffing the facility or hiring low-wage caregivers without proper training or skills. When there is a lack of staff, a lack of training or both, the patient often suffers because the nursing aides and nurses do not continuously monitor the patient’s skin to detect any early developing bedsore. All nursing homes have an ethical obligation to safeguard each resident in their care. Whenever a loved one suffers from a bedsore in a nursing home, it is crucial to hold medical staff accountable for their negligence. This is because any early stage bedsore can be reversed to avoid the catastrophic results of a progressing pressure sore. Hiring a Michigan bed sore attorney is the first step in ensuring that the loved one receives the best treatment possible to heal from a serious wound. The lawyer can take every step necessary to stop the neglect and bring in professionals to provide proper medical care. An aggressive Michigan nursing home negligence attorney can serve as a legal advocate to protect your loved one and ensure they receive quality care to heal their wound. Fill in the contact form here to contact the reputable lawyers listed below. These attorneys offer a no-obligation free consultation to discuss all legal steps to stop the neglect and obtain financial compensation.